During the month of October, we are honored to highlight Tyler Newkirk, Cyber Security Analyst at AllianceBernstein, as our October Volunteer of the Month! Thank you, Tyler for your support of our events and the energy you bring to them. We truly appreciate your dedication to our mission and local veterans and military families. 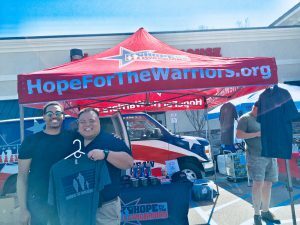 Tyler Newkirk (left) with Joey Mac Dizon, Hope For The Warriors Military and Veteran Program Coordinator at the 2018 Cars and Guitars event.